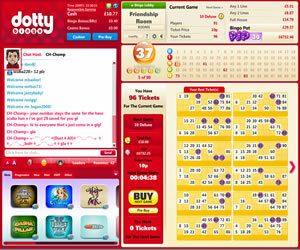 Dotty Bingo entered the online bingo market in June 2011. The site powered by the Microgaming software and is part of the Microgaming network alongside several other big names including 32Red Bingo, Butlers Bingo and Dream Bingo. Land on the home page for the first time you will find quite a subdued red and white colour scheme with a retro feel thanks to the dotty background. This is not necessarily a bad thing though as it makes a change from the more usual bright and in your face colour schemes we are used to. The rest of the Dotty Bingo homepage is nicely laid out with a small selection of banners advertising their bonus offers, latest games and television advert, and once again they are not so flashy that they become irritating. Registering is a simple procedure you will be welcomed with some free money so you can sample everything they have to offer before deciding whether to make a deposit or not. If you like what you see and decide to play for real there are plenty of bonuses on hand to make your money stretch that little bit further. The Dotty Bingo lobby is well designed and extremely easy to navigate thanks to the six tabs leading to the different areas. Clicking on each tab will reveal the bingo rooms and the games available. The bingo tab shows you the hours the rooms are open, the number of players taking part, the price of the cards and the next games jackpots, so you can easily decide where you want to play. At the top of the lobby you have access to the cashier where you can make your deposits and withdraw your winnings and this sits alongside live help with is accessible 24/7. Once you have clicked on to the yellow 'Play now!' button you will be taken into your chosen bingo room. The rooms look great with a large panel on the right dedicated to showing your purchased cards. Above that you will find two panels displaying the balls as they are called and all of the financial information relating to the current game. To the left of the screen you will find the chat panel which includes some nice features such as the ability to change your avatar, and if you are a funded player there are loads to choose from including a range of generic human faces as well as animals, flowers, dive, cars and motorbikes. Promotions are the one area that Dotty Bingo really fall down on as there is very little to get excited about. There are daily jackpots seven days a week but the prize pots cannot compete with the bigger brands out there. 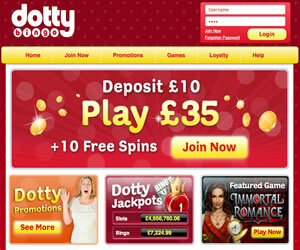 There are plenty of weekly promotions but they are all based around you winning very small amounts of bonus money and even the monthly specials could do with a few more pound throwing in to make the jackpots worth winning; This is one area that Dotty Bingo really needs to focus on before they will be truly competitive. Dotty Bingo is not a bad online bingo site at all but sadly they opted for one of the less popular bingo platforms and this has bought with it a lack of rooms, lower jackpots and poor quality promotions. If you are a fan of the Microgaming software however you could do worse then sign up and give them a try as the site does have a quality feel about it that other brands on the same network lack. 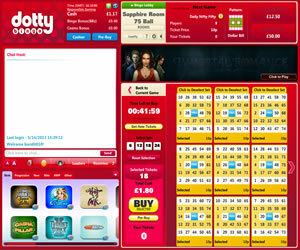 Dotty Bingo currently only offers two versions of the game online; 75 and 90 ball bingo. However, what this brand lacks in bingo variants, it more than makes up with in instant win games. 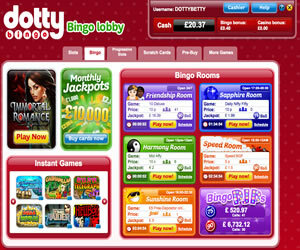 Wagering requirements at Dotty Bingo are 1x the amount of deposit and 5x the amount of the bonus received. Wagering on bingo only counts as 100% towards these requirements, casino is 50%.